The Backbone.js SPA template is designed to get you started quickly building interactive client-side web apps using Backbone.js. 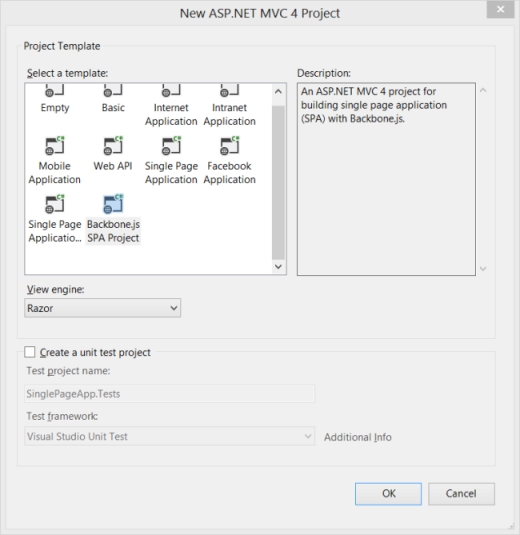 The template provides an initial skeleton for developing a Backbone.js application in ASP.NET MVC. 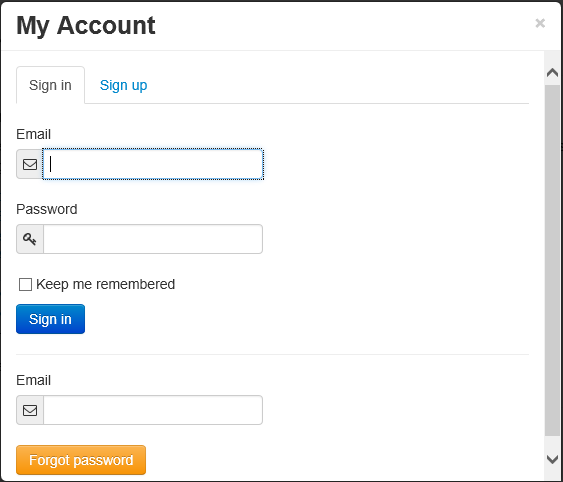 Out of the box it provides basic user login functionality, including user sign-up, sign-in, password reset, and user confirmation with basic email templates. Download and install the template by clicking the Download button above. 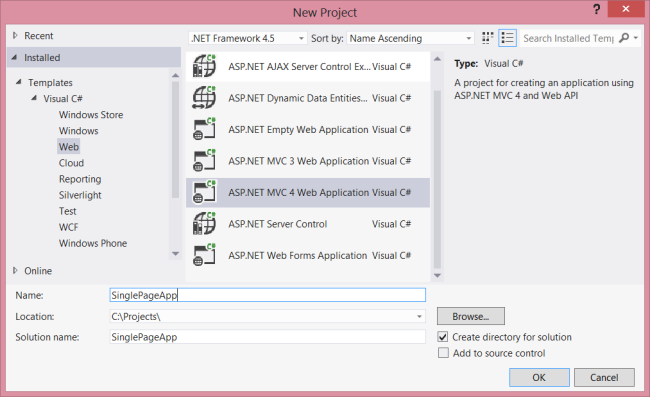 The template is packaged as a Visual Studio Extension (VSIX) file. You might need to restart Visual Studio. In the New Project wizard, select Backbone.js SPA Project. Press Ctrl-F5 to build and run the application without debugging, or press F5 to run with debugging. Application is defined in application.ts. This object initializes the application and acts as the root namespace. It maintains configuration and state information that is shared across the application, such as whether the user is signed in. The application.start method creates the modal views and attaches event handlers for application-level events, such as user sign-in. Next, it creates the default router and checks whether any client-side URL is specified. If not, it redirects to the default url (#!/). In Backbone.js, a router provides methods for routing client-side pages and connecting them to actions and events. The template defines a single router, in router.ts. The router creates the activable views and maintains the state when switching views. (Activable views are described in the next section.) Initially, the project has two dummy views, Home and About. It also has a NotFound view, which is displayed if the route is not known. Extending with Activable adds two new methods to the view, activate and deactivate. The router calls these methods to activate and deactive the view. The ~/Scripts/application/lib folder contains a few handy jQuery plug-ins. The form.ts file defines a plug-in for working with form data. Often you need to serialize or deserialize form data and show any model validation errors. The form.ts plug-in has methods such as serializeFields, deserializeFields, and showFieldErrors. The following example shows how to serialize a form to a model. The flashbar.ts plug-in gives various kinds of feedback messages to the user. The methods are $.showSuccessbar, $.showErrorbar and $.showInfobar. Behind the scenes, it uses Twitter Bootstrap alerts to show nicely animated messages. Now let's look at the server side. In a single page application, the server plays only a small role in the user interface. Typically, the server renders the initial page and then sends and receives JSON data. If the folder name is not specified, the default folder name is "ClientViews". If your client view also uses partial views, name the partial view with an underscore character (for example, _SignUp). The IncludeClientViews method excludes any views whose name starts with an underscore. To include a partial view in the client view, call Html.ClientView('SignUp') instead of Html.Partial('_SignUp'). To send email, the template uses Postal. However, Postal is abstracted from the rest of the code with the IMailer interface, so you can easily replace it with another implementation. The email templates are located in the Views/Emails folder. The sender's email address is specified in the web.config file, in the sender.email key of the appSettings section. Also, when debug="true" in web.config, the application does not require user email confirmation, to speed up development. 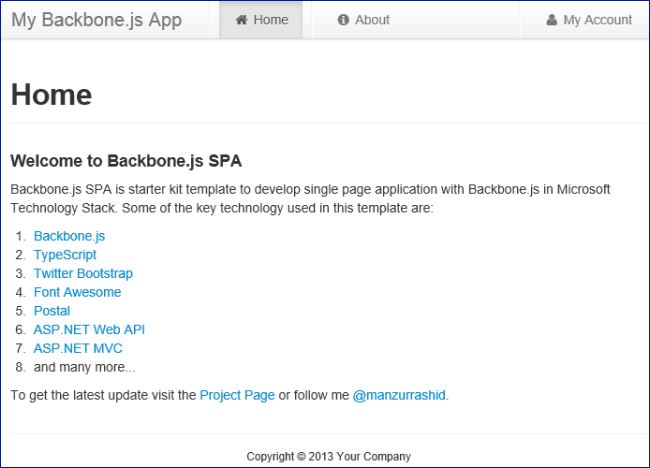 You can also find the Backbone.js SPA template on GitHub.